When I was a kid it was easy to find the hero in the story. The guy with the tights, the girl with the lasso, the mild-mannered person who occupied nearly every frame of the book until something bad happened, and then they pulled a cape out and went to work was the good guy. The bad guy was the one who either had a sinister grin on his face, or was dangling the hero’s lady-friend or aged aunt off the edge of a building. Comics have changed. Heroes are dark. Moral ambiguity has become a hot trend, and justice is in the eye of the beholder. Turn the other cheek in today’s comics and you’re like to get it lasered off. Postal #1 was released this week, a new book from writers Bryan Hill and Matt Hawkins. It focuses on the small town of Eden, Wyoming, a place that for all intents and purposes is very much like that mythical garden, as the apple core was mouldering and the snake alone in the tree of knowledge. Eden is a town entirely populated by criminals. It’s like the Australia of the west. The mayor has a rap sheet. The Sheriff is wanted for solicitation, the short order cook has ties to terrorist groups. The deal they have with the government is that they take care of their own. If there’s a crime, they deal with it internally, often with deadly results. The only one in Eden who is innocent both of any crime and of any malicious thought, is Mark, the town postman. Bryan Hill (Netherworld) and Matt Hawkins (Lady Pendragon, Witchblade) have scripted an enticing little story here. Not only does Mark, as postman, have access to personal information about everyone in town, but he is, as far as I know, the first hero in a mainstream comic to have Asperger’s Syndrome. (A form of autism.) Mark could be described as “socially awkward”. He can function normally, but has ticks that make him seem different. I don’t often quote from the comics I read in reviews, but they sum it up perfectly. This is such a poignant and perfectly worded way of describing a state of being. It makes something as confusing as Asperger’s just a little more clear for those of us who have very little knowledge of what it is. Isaac Goodhart (Artifacts) got his shot by becoming one of the winners of the annual Top Cow talent hunt, which offers the chance of becoming a pro to up-and-comers who submit their work. It’s obvious that he deserved the win. He’s great at the design aspect of people. Eden is a town where there aren’t that many, 2,198 to be exact, but that’s still a lot of people to draw. It’s hard to come up with that many design, but each has it’s own specific traits, and that helps to define the look of the town as a whole. Postal has a very Twin Peaks vibe. David Lynch never dreamt up a town so cloistered and strange, and I’ve a feeling that it will only continue to strangify itself as the issues progress. (There is also a Peaks-style tease for issue 2 on the last page, which was wonderful.) And there are also rap sheets for some of the towns’ more high profile residents at the back of the book. It begs the question, who’s watching Eden? It’s a great way to end, implying that despite Eden’s nature of keeping to itself, there are those who would make sure that the apples are still on the tree. Bryan Hill and Matt Hawkins have dropped the dove in a nest of vipers. Mark is the perfect candidate to handle the weirdness in town because of his own inherent differences. As the vipers strike, he sees the whole affair as lights, and as the postman for the town, he knows each and every name. This seems like a fight Mark was born to win. 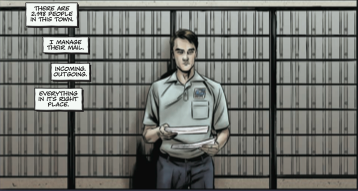 Postal #1 is a departure from the super hero in a way that hasn’t been seen before. Rather it’s a light shone on how special some people can really be. In this case the change in super heroics is welcome and appreciated. This entry was posted in brad gischia, Comic Book Reviews, comic books, image comics, review and tagged Betsy Gonia, Bryan Hill, comic book reviews, comic books, image comics, Isaac Goodheart, Matt Hawkins, Troy Peteri. Bookmark the permalink.